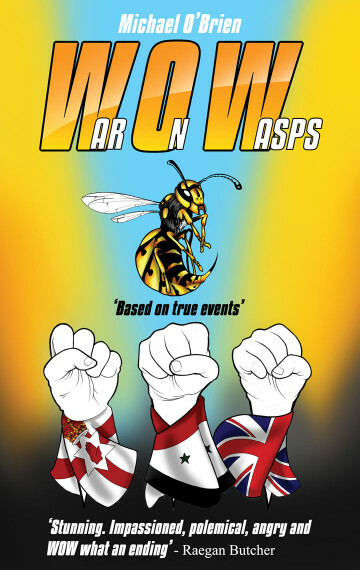 A novel based on recent true events spanning Northern Ireland, London and the Middle–East, ‘War on Wasps’ is a novel of love and loss, of fear and faith, of treachery and terrorism and why well-intentioned people do terrible things. It is the story of Suzy Regan who flees from Belfast after her brother Joey is ‘disappeared’ by the ‘real’ IRA and her father is killed in the Omagh bombing, to seek a new life in London. Lonely and working as a chambermaid in the Hilton hotel she meets and is attracted to sophisticated and mysterious Hassam Mosani, a Jordanian Muslim journalist who seduces her. Pregnant and responding to his offer of marriage, she attempts to board a plane to Jerusalem. Unbeknown to her he has planted a bomb in her bag which he plans to detonate over central London. DCI Tom Tredwell, a traumatised veteran investigator of the London transport bombings (7/7), who has been diagnosed with terminal cancer, is called in due to his experience in dealing with Muslim instigated terrorist threats. Working in the shadow of his own mortality, he identifies Mosani as a terrorist bomber. In a race against the clock, Tom attempts to prevent the atrocity and rescue Suzy in the limited time he personally has left. Based on real events this tense, compelling and intelligent thriller offers a serious exploration and moral analysis of the motivation for and operation of terrorism in the West. A necessary and chilling warning for our times. “I just love my country. I don’t want any more victims. I don’t want any more killing. I want peace. That’s why I’m on the case. That’s why I hold you guys to account. That’s why I’m here,” Tom asserted.